Are you a fan of Battlebots? Maybe Robot Wars? Have you ever wanted to know what it's like? Well, here's your chance in our exclusive robot style RPGs! All you need to do is follow three simple steps to join up. 1. Create your own bots in some sort of computer-aided-design (CAD) program, or draw them. 2. Enter stats for your bots using the point system described below. 3. Role play with your bot on a weekly basis, posting your strategies in the RP Forum. To pit your robot against other robots, enter a tournament. For some tournaments you'll enter just one robot; for others you'll enter a team of multiple robots in different weight classes. Some tournaments alter some of these rules, so make sure your robot is allowed by those changes. Each week (generally) you'll be matched against one or more other robots. The winner of each match is decided by a writer, who looks at the robot CADs, the stats, and most importantly the competitor's role plays to decide what happens in the match. The roleplay is your chance to describe your strategy for your bots' fights. You can write anywhere between a sentence and a few paragraphs (or whatever is allowed by the tournament.) If your opponent has already submitted theirs when you are writing your roleplay, you are not allowed to reference their strategy in what you write. Failure to do this will also have serious consequences. The deadline is Midnight EST every Sunday, unless otherwise specified by the tournament director. Roleplay on time or you'll forfeit the match. This set of rules and regulations will govern all RPGs officially sanctioned by ARC. Drowning City will not officially support RPGs that do not use these rules. This document is meant to be as all-encompassing as possible, but remember that we promote abstract thinking. If you have a design not covered under this document, present it to the moderators first. Administrators reserve the right to modify a bot's individual stats based on discrepancies with the picture of the design. The administrators also have the right to reject any robot submission, stat allocation or design aspect that is considered to be unfair or exploiting the rules in any way. All designs must comply with the regulations of the RFL for legality (see http://www.robogames.net/rules/combat.php for details.) For example, no external combustion engines, liquid or gaseous weapons, electrical stun weapons, RF jamming, entanglement devices, etc. ARC does allow the use of flames as a weapon but not in the form of plasma or oxy-acetylene cutting torches. If you are unsure of your weapon's compliance to the RFL rules, ask a moderator. Obviously we can't weigh a picture of a robot, but please try to make yours look like it belongs in the weight class it will compete in. This one is somewhat opinion based, and also limited to the designer's artistic capabilities. However, we ask that you try your best to keep your designs realistic. For example: A picture of a LW with 5 Etek motors stuffed into it is not only incredibly unrealistic, it's also pointless due to the limit of the weapon stat. Similarly, a SHW with a 3:1 reduced mag motor for lifting will still lift, but will be highly unrealistic. Also, if you plan on using uncommon technology (i.e. Walkers, Omni-drive, Turbo and EFI engines) please have the decency to know how they actually work. This will be any robot using tires, treads, saw blades, shuffling beams, parts of its own chassis and frame, semi-omni (mixture of omni and normal tires), giant track balls, or any other rotating mass touching the floor to propel itself. Wheeled robots will be allowed 30 stat points. They must have at a minimum 1 Speed, 1 Torque, 1 Traction, and 1 Armor. There are no maximum stats for wheeled bots, except for those limited by the total number of points available. Tracked robots and shuffling robots receive no special bonuses. Other propulsion systems (screws, hovering bots) will also default to wheeled robot rules. If the propulsion system of the robot is left unspecified, it will be assumed to be a 4 wheel-drive robot. This is any robot a hovercraft (air or magnetic) system. These robots will have a maximum of 30 stat points available. They must have 0 Traction and a minimum of 1 Speed and 1 Armor. There are no maximum stats for ZT bots, except for those limited by the total number of points available. This is any robot that moves by contact with the floor other than that outlined under section A. Also, no individual component of the walking system can rotate 360 degrees around an axle. The 360 degree motion of the 'feet' must come from the combined motions of other parts. Walking robots have a maximum of 34 stat points. They must have at a minimum 1 Speed, 1 Torque, 1 Traction and 1 Armor. The total speed for any walker cannot exceed 5. The total torque for any walker cannot exceed 2. All stats for a walker are assumed to mean the same thing they do for any other type of robot. All parts of multi-bots or cluster-bots must have the same motivation (i.e. all wheeled, or all walking). They will follow the rules in 1.4 appropriate to their movement type. Cluster-bots will have up to 30 - 4n points to work with, where n is the number of bots in the cluster. For instance, if you entered a 2 part cluster-bot, you would have (30 - 4*2 = ) 22 points to work with. For 3 parts, you would have 18 points to work with, and so on and so forth. Walking clusterbots get 34 - 5n points to work with. In accordance with current RFL rules, a cluster is not counted as knocked out unless all of its sections have stopped moving. Multi-bots may not start out attached to one another. Some robot designs, such as Bombshell or Razorback, may have multiple configurations. If you wish to design a robot of this type, note that you are only allowed to swap points between weapon and armor for different configurations. Your drive stats (speed, traction, and torque) must remain the same between different configurations of your robot. Your tournament organizer may also impose a limit on the number of different configurations your robot can have or the number of stat points available to this type of robot. Each stat has a different function. Speed: This stat affects how fast your bot moves around. For thwack bots, including Y-drives, this acts as your spinning speed while thwacking. Torque: This stat determines linear acceleration, the ability to push other robots, and the acceleration that you push another robot at. Traction: This stat governs rotational acceleration, the amount of control a robot has, and how much knockback it might suffer upon impact. Armor: This stat is how durable your bot is. The higher it is, the more damage the bot will be able to withstand. Weapon: This stat affects how powerful your bot's weapon is. For thwack bots, including Y-drives, this stat indicates the bot's actual floor maneuvering speed, while your bot is spinning. The driving ability of a robot is determined by a combination of speed, traction, and torque. The top speed of your robot is determined directly by the speed stat. Linear speed is how fast the robot can travel from point a to point b, and also includes a provision for deviation due to uncontrollable speed. For robots that use their weapon as their means as propulsion (Gyroscopic procession or propeller bots such as Wrecks or No Fly Zone), linear (as well as rotational) speed will be determined as weapon/traction. Rotational speed is how fast the robot can move in a complete 360 degree circle, while sitting in place. For thwackbots, the rotating speed also corresponds to their energy at the tips of their weapon, and will count as their weapon score. A robot with a speed of 10 will have a thwacking power of 10 as well. For vertical thwacks there isnt enough time for their weapon to accelerate to full speed from a single 180 degree rotation so it will be assumed the weapon power is the midpoint between Speed and Torque. The rate at which your robot accelerates from a stop is determined by a combination of speed and either torque or traction, as described below. All robots will be considered to travel at 75% of their speed instantaneously. Linear acceleration will be determined by a combination of speed and torque. A robot will reach its top speed in the number of seconds you get if you divide the speed by twice the torque. So a robot with 6 speed and 1 torque would reach top speed in 3 seconds. A robot with 6 speed and 3 torque will reach top speed in 1 second. Rotational acceleration will be determined by a combination of speed and traction. A robot will reach its top rotational speed in the number of seconds you get if you divide the speed by twice the traction (same as linear acceleration). Control is mostly dependent on speed and traction. The greater the disparity between speed and traction, the more chance you have of losing control of your robot. This ties in with both deceleration and rotational speed. If the disparity between traction and speed is greater than 3, the robot will be mostly uncontrollable. The higher your traction stat, the less likely you are to experience wheelspin if you change directions. The speed at which a robot pushes will be determined by the mid-point between speed and torque, rounded to the nearest half (same as effective ramming power). In the event of this being equal between two robots, the one with the higher torque stat will be able to push its opponent. For example, a robot with speed/torque 8/2 will push at 5 speed. a robot with spd/tor 6/4 will also push at 5 speed, but will be able to slowly out-push its opponent (and also accelerate to maximum pushing speed more quickly). If a robot is lifted off the ground such that only some of its wheels are touching the floor, its torque will be halved. This will apply equally, regardless of how many wheels the robot has and how many are lifted off the ground. The traction stat decides how much the robot is affected by being hit by spinners, hit by rammers, and even affected by its own spinning weapons. As a general rule, as long as the robot has higher traction than a spinner has weapon or a rammer has speed, it will NOT be moved when hit. If the traction on the robot being hit is lower than these stats, it will be displaced 1 foot for every point of difference, minus 3 inches for each wheel the robot has over 2. For example, a 12 Weapon spinner hits a 2 wheeled robot with 7 traction. The spinner knocks the opponent 5 feet away. The same spinner hits an 8 wheeled robot with 7 traction, and the opponent is only knocked 3.5 feet away. For weapon recoils, the robot recoiling will be knocked away by how much its weapon exceeds its own traction, divided by two. The robot will also spin opposite the direction of its weapon rotation 180 degrees, minus 45 degrees for every pair of wheels over two. Regardless of the number of wheels a robot has, this spin will be no less than 5 degrees. Wheels double-layered (or triple, or whatever) on the same axle do not count as extra wheels. The armor stat determines how resistant your robot is to being damaged or knocked out by an attack. Armor can be either passive or active. Passive armor is the main chassis of the robot, to include all wedges, plows, and plates that are a part of the chassis or frame, and will have the base armor stat. Passive upgraded armor includes wheel guards, plows, wedges, bars, spikes, weapon shafts and heads (thwacks) and plates that are solidly attached but obviously not part of the main chassis. Active armor is any armor that is not solidly attached to the frame, or uses a special attachment for some sort of advantage. As a default, all armor counts as the armor stat with no additional bonuses. However, you can give plows, wedges, rams, etc. additional bonuses as long as you offset that bonus with a subtraction from all other areas. For example, if your robot has 8 armor and you give its wedge a +2 bonus, the wedge will have 10 armor and the rest of the robot will have 6 armor. For any armor to be given any bonuses at all (minus spinning weapons), the total amount of armor receiving bonuses must not exceed 1/3 of the total armor on the robot as decided by the moderators and/or competition director. Body armor must stay constant across any alternative set-ups. Every part of that collection is on the same side. Every part of that collection is on the same plane. The entire collection does not make up more than 33% of the surface area. All decisions on what can apply for this bonus depend on staff discretion. All active weapons with 5 points or greater power receive an armor bonus of +2. For example, if your robot has 7 armor and a 7-power flipping weapon, the flipper will be considered to have 9 armor. Spinners are a special case. Spinning discs, bars and other instruments that have a shorter diameter than the robot's longest axis will have a +4 bonus. Ring, cage, and shell spinners will have a +2 bonus along with all spinning instruments that affect an area outside of the wheelbase of the robot. Any robot obviously attempting to skirt this rule by creating a spinning weapon marginally shorter than the robot's longest axis can still be made subject to this rule, at the discretion of the tournament organizer. The weapon stat determines how powerful your robots weapon (or weapons) are. If you have a design for a weapon not listed here, the same policy applies as before. Just submit it to the moderators and/or competition director for approval and final decisions. All approved designs will be added to this rule set. Any robot using multiple active weapons will be reduced in weapon power based on two conditions. If the weapons are operated by the same actuator, on the same axle i.e. twin spinning discs, no deduction will occur. If the weapons are powered by the same motor but on separate axles i.e. a motor powering spinning bars on opposite sides of the robot, each weapon will lose one point. 2 weapons = 2/3 of the weapon stat, rounded either up or down to the nearest whole number. If mid-way between, round up. 3 weapons = 1/2 of the weapon stat, rounded either up or down to the nearest whole number. If mid-way between, round up. 11 weapon power for 2 weapons = 7.33 points for each weapon. Rounded down to 7 for each weapon. 15 weapon power for 3 weapons = 7.5 points for each weapon. Rounded up to 8 for each weapon. Robots with multi-weapons absolutely must have a base weapon stat of 2 before tournament start, or their stats will be edited to be legal. Each weapon still follows the weapon armour rule in the above ruleset. An axe that gets its weapon power cut down will still have the same main armour +2 value. However, a weapon that gets dropped to 4 weapon power or below will not receive a weapon armour bonus. If a participant wishes, they may instead specify individual weapon power instead of using this rule. So, if one made a robot with two weapons (let's say a spinner and a flipper), and gave it 14 weapon, they could either have the flipper and the spinner have 10 weapon power, or specify in a way such as what follows: Weapon: 14 (13 spinner, 1 flipper). Clutch transfer systems allow a robot to store energy by spinning up a bar or drum and then transfer that energy to another weapon system. For an example see Warrior Clan, which transfers energy from its ring spinner to power its flipping plate. Weapons which use a clutch transfer system must allocate 1 point to the clutch, and the attached weapon will be given half the power of the main weapon. Any additional attached weapons will give -1 to the entire system, and then suffer the halving penalty. A weapon powering a clutch system must be allocated at least 2 points to function. Neither the clutch nor any attached weapons will gain any armor bonus. For example, a spinner with a clutch flipper with 13 points in weapon will give one weapon point to the clutch. The spinner will have a power of 12, and the flipper one of 6. The spinner will get an armor bonus, but the clutch and flipper will not. If one were to also attach a clutch hammer or something, the spinner would have power 11, and the flipper and hammer power 6 (5.5 rounded up). Turrets, such as the one on Tazbot, allow certain weapons to have more utility. By putting a weapon on a turret, it allows that weapon to have 360 degrees of range; a large advantage over something like an axe, which can only hit whatever is directly in front of it. Any higher weapon values will start detracting from the benefit of the turret as the weapon will become difficult to control. It will never move at a speed fast enough to do significant damage. Srimechs (self-righting mechanisms) that serve no other function are still counted like any other weapon. Srimechs require 1 point to function and will act as 1-point flippers unless otherwise specified by the designer. Rammers and robots using static spikes (provided they are on the ramming end of the robot) will hit with a theoretical weapon power equal to the midway point between their Speed and Torque, rounded down to the nearest whole number. Rammers have NO breakthrough factor, unless they have defined spikes or teeth. The theoretical weapon power applies to knockout probability. This rule also applies to robots with active weapons that can be used as ramming weapons, or that have secondary passive ramming weapons. Ramming Bars, used on designs like Force Feedback, Stingray, Smilodon, and Probot, are a weapon that consists of a mass that is fired horizontally without the purpose of piercing. These designs use a "keep away" type stick for a variety of purposes: to push the opponent away, to dislodge themselves, to warp the opponent's wedges, or to slow down spinning weapons. Ramming Bars generally do not cause much damage, unless the opponent they are hitting are trapped against a wall, as ramming bars push opponents away. These are always fast moving, and operate mostly the same as overhead striking weapons where an increase in weapon power results in a faster striking force. "Thwacks" are any robot that generates force by rotating the entire robot. Theoretical weapon power is approximately equal to the speed stat of the robot. The type of thwack head used will determine the type of damage done. Blunt weapon heads such as sledge hammers will dent and buckle armor with a higher KO factor, while sharp weapon heads will pierce and slice armor with more visible effects. Overhead thwacks rotate their weapons vertically using the torque reaction from accelerating their two-wheeled body (see Overkill for an example.) The theoretical weapon power will be the midway point between the robot's Speed and Torque, rounded down to the nearest whole number. "Smart Thwacks" are those that can move around while thwacking using a "melty brain" or similar system. For these, the speed stat still determines the theoretical power of the robot, but the speed the robot moves across the arena floor will be determined by the weapon stat. Melty-brain spinners will be given an automatic +3 bonus to traction, only to be counted when considering spin-up speed. Melty-brains will also be allowed to give an armor bonus to their teeth, ignoring the usual limitation of armor bonuses to a single side of the robot. Speed and weapon combined may not exceed 18. Weapon points used for translational movement are subject to reduction by the multiple weapons rule, below. Spinners are any robot using a rotating mass to inflict damage. This includes but is not limited to vertical bludgeoning devices, friction driven rings, overhead bars and cages, shells, discs, flywheels, saws, chainsaws, spiked belts, drums, "egg beaters", and any other rotating mass designed for inflicting damage. Weapon spin-up time will scale evenly: a 12 powered spinner will reach 12 weapon power in the same amount of time as a 15 powered spinner will reach 15. Writers discretion should also be used when determining spin-up time: obviously a tiny flywheel will take less time to get up to speed than a shell. Generally speaking, it should take them 2-6 seconds to reach full speed, size and mass dependent. Vertical spinning weapons are capable of hitting opponents into the air. The weapon power will determine how high. The height will be a number of feet equal to 1/4 of the weapon's power. This is equivalent to half the height achieved by a flipper of the same power. Lifting weapons are any weapon designed to forcefully pick an opponent up off of the floor. These include but are not limited to lifting arms, lifting spikes, flipping arms, actuated jaws, lifting or flipping wedges, clamp systems, forklifts, and any other weapon used to pick an opponent up. For this set of rules we will acknowledge that no one builds a lifting arm that won't lift an opponent in that weight class. All lifting and flipping weapons, given a value of 1 weapon power, will be able to lift an opponent to the full height of the weapon's capability. Weapon power will decide how quickly that will be accomplished. 1 weapon power will result in an excruciatingly slow lift, and will likely result in the opponent being able to escape before being lifted. 2 weapon power will result in a slow lift. 3 weapon power will result in an average paced lift. 4-5 weapon power will result in a fast-paced lift. Any higher weapon values will start detracting from the benefit of the lifter as the weapon will become difficult to control. It will never move at a speed fast enough to do significant damage. Flippers sacrifice control of the weapon to allow a high speed motion in one direction. Flippers will come back down shortly after lifting, and cannot be moved to anywhere but the final point in the stroke. Flippers are always capable of lifting the opponent at high speed, but the weapon power will determine the height of the flip. This height will be in feet and determined by the robot's weapon power divided by two. At 1 a flipper will only move an opponent 6 inches higher than the top of the stroke, while at 10 weapon power the target will be tossed over 5 feet high. If the flipper power is greater than the opponent's armor, impact damage can be suffered. Overhead striking weapons include but are not limited to hammers, axes, swords, impaled dead babies and any other weapon swung overhead to cause damage. Hammers are designed to do large amounts of damage in a single strike. Overhead weapons like these do damage differently from all other weapon types, and as such need their own damage scale to accurately reflect the type of damage they do. Its also worth noting that some of this depends on the type of axe head, whether it be blunt, or with a point, or some kind of combination. This, in addition to the surface that they're striking, requires some writer discretion to suss out exactly how much, and what kind of damage is being done. Piercing weapons are extremely powerful claws or spikes designed to use force to break through an opponent's armor. Claws will always be slow moving; about 15 degrees per second. Claw type weapons will only pierce the opponent when they are equal to or greater than the armor stat of that opponent. Weapon power combined with the opponent's armor will determine the amount of damage, and it will adhere to the corner damage rules for all parts of the robot (since the piercing tool constitutes a corner). Pneumatic spikes use a rapid release to affect opponents. Pneumatic spikes will achieve similar damage to crushers i.e. - corner damage rules anywhere on the opponent, with the advantage of firing more quickly, and the disadvantage of having a harder time aiming and a harder time affecting an opponent instead of slipping off. Rotary piston spikes are rapid firing, and driven by cam/crank action from an electric motor or gas engine. Up to two spikes can be used from the same motor before incurring a multiple weapons deduction. These spikes will follow the normal rules of breakthrough and damage based on their power, and will hit at x times per second, where x is half of their weapon power. Certain robots will prefer a "Complete Control" style of clamping, where the weapon does not pierce the armor, but rather takes control of it. These weapons will be faster but never pierce the opponent's armor. The speed of the clamp depends on the weapon power invested, which fall along the same guidelines as the speed for lifters. Cutting weapons are a weapon (saws, drills, chainsaws, whatever), potentially mounted on an articulating arm, designed to damage opponents through prolonged exposure to the weapon. A single-degree of freedom "arm" holding a cutting weapon only requires 1 weapon power to function. Cutting weapons do NOT receive any weapon armor bonus regardless of their power. high-hardness sawblades are fragile: treat them with care. Flame weapons, used on designs such as Raging Scotsman, are usually designed as crowd-pleasing devices that do not do much damage. Writer's discretion may be used if robots have wooden or other flammable parts, or if the flamethrower is mounted inside of a crushing weapon, like on Mohawk. Flamethrowers are limited to 3 weapon power. When writing a match, writers use these guidelines to determine how much damage one robot's attack has done to another. The amount of damage dealt depends on the difference between the attacking weapon's power, the defending surface's armor, the type of the weapon, and the shape of the defending surface. Damage is definable in two main forms  flat surface and corner damage. Everything that isnt a corner is a flat surface, including curved surfaces. Hitting a flat surface will not result in the other robot getting spun away. Hitting a flat surface will never result in a knockout. 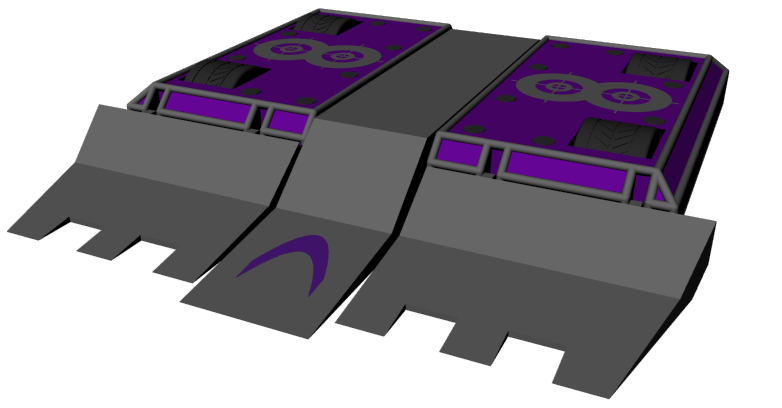 A corner is defined roughly as where two surfaces meet at close to a 90 degree angle (the niceties of which are left to writers discretion) Hitting a corner will result in the other robot getting spun away, and will do damage as if the weapon to armor disparity were two points larger than flat surface damage. 3 -- Minor damage. Scrapes and nicks, bending perhaps but the weapon will not penetrate the armor fully. No chance of a knockout. Equivalent to 1 point of corner damage. 4 -- Some damage after repeated hits to the same area. Minor penetration. An opening will be formed and after repeated hits the opening will cause the corner damage rule to apply to larger sections of the robot. Chance of a knockout only after an opening is formed and there are many repeated hits. Equivalent to 2 points of corner damage. 5 -- Significant damage. The flat surface bends noticeably, and openings will form with repeated impacts. Equivalent to 3 points of corner damage. 7+ -- Catastrophic damage: Large openings or significant buckling damage from a single hit will limit a robot's ability to function. No amount of weapon power will cause a one hit knockout against a flat surface, but the openings formed will count as corners, and knockouts can happen with any corner impact at this level of damage. Equivalent to 5 points of corner damage. Wheels can be knocked off if the point different between their armor and the weapon hitting them is 3 or greater. Spinners will tend to rip pieces off, tear gashes into armor, or rip wheels off. All overhead weapons deal corner damage - exceptions are possible if the the weapon strikes a part of the robot that is curved or very slanted, such as typhoon 2's shell or steep wedges. This is the exception to the rule, and determining exactly what is and isn't curved enough to merit dealing less than maximum damage is left to the discretion of the writer. These will tend to warp and dent armor (with crushers also piercing), and will usually buckle wheels instead of fully removing them. These will tend to pierce through armor, generally causing less buckling but giving them a better chance at hitting internals directly. This includes saws, drills, chainsaws, etc., and will tend to cut through armor, dealing more damage with prolonged contact. 0-4 -- There will be little to no effect on the weapon's performance throughout the fight. No self-KO chance. 5 -- The weapon will begin showing signs of fatigue, taking longer to spin up toward the end of the match. No self-KO chance. 6 -- The weapon will do some internal damage to its own supports and will cease to work after 5 hits. However the rest of the robot will continue to function. No self-KO chance. 7 -- The weapon will do internal damage to the entire robot and will cease to work after 5 hits, and will cause loss of drive power on the 5th hit. For every point difference beyond 7, the robot will die in one less hit. So an 8 point difference will cause the robot to die in 4 hits, a 9 point difference will die in 3, and a 10 will die in 2. If the difference is 11 points, you're a walking atom bomb. Have fun with that. Since melty-brain spinners power their weapon with their drivetrain, there are a few differences between the self-damage they suffer, and the self damage conventional spinning robots suffer. 0-4 -- There will be little-to-no effect on the robots performance. No self-KO chance. 5 -- The robot will show fatigue over the course of the match, taking longer to spin up. No self-KO chance. 6 -- The robot will fatigue more quickly, and will start to spin unstably and have trouble showing controlled movement during the last minute of the match. Small self-KO chance. 7 -- Each hit will cause more and more damage to the drive motors and internal supports, making the robot harder and harder to control until it destroys itself on the fifth hit.